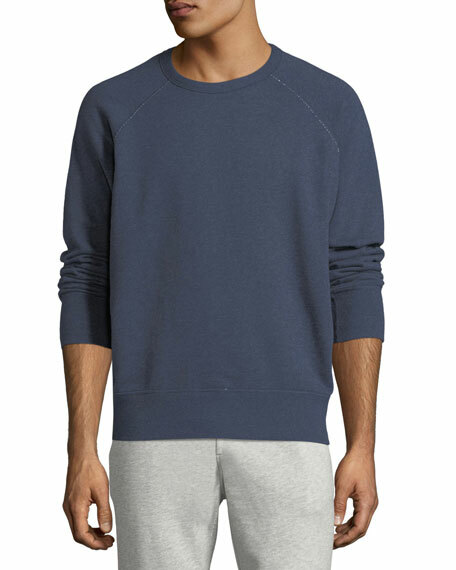 Rag & Bone athletic-inspired sweatshirt in slub terry. Brunello Cucinelli "Spa" hoodie in colorblock jersey. Drawstring, hooded neckline. Two-way zip front. Straight hem. Cotton/spandex. Made in Italy. Model's measurements: Height 6'1"/185cm, waist 32"/81cm, typically wears size M.
Moncler sweatshirt featuring logo flag graphic print. Crew neckline. Long sleeves. Pullover style. Cotton. Imported. Model's measurements: Height, 6'1"/185cm, waist 31"/79cm, suit 40, shirt 15.5x35, inseam 32"/81cm. EXCLUSIVELY AT NEIMAN MARCUS Ovadia & Sons "Dune" sweatshirt with distressing. Crew neckline. Long sleeves. Pullover style. Cotton/polyester. Machine wash. EXCLUSIVELY AT NEIMAN MARCUS Ovadia & Sons "Dune" sweatshirt with distressing. Crew neckline. Long sleeves. Pullover style. Cotton/polyester. Machine wash. Imported. 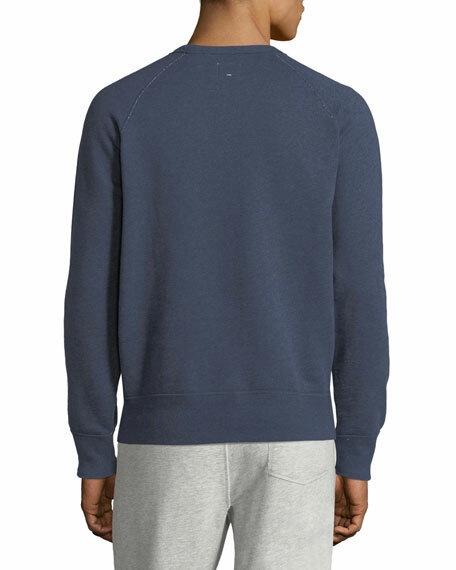 Rag & Bone "Lance" garment-dyed reverse jersey sweatshirt with dagger embroidered chest detail. Crew neckline; ribbed band. Long sleeves; ribbed cuffs. Classic fit. Ribbed hem. Pullover style. Cotton. Imported.